Umbra is an Orc warrior located in the hills east of Suran. He wields the infamous Umbra Sword. If you speak to him he tells you of his life and that he wants to die a warrior's death. You can then choose to fight him to fulfill his wishes. Though there are several strategies to defeat him, he is very powerful and it is recommended to wait until you are a relatively high level character to try this fight. Aside from wielding his eponymous blade, Umbra also wears an Orcish cuirass with matching greaves, helm, pauldrons, bracers, boots, and tower shield. Like all Orcs, he has a natural resistance to magicka, and can boost his health, fatigue and attack for short periods, at the cost of agility; otherwise he knows no spells. Greeting: "Have you come seeking me? My name is unimportant, and my accomplishments are few." accomplishments are few: "What are any of my accomplishments in the whole of this world? I have traveled from one end of the land to the other. I have killed creatures that can stop a man's heart with but a look. I have the blood of man and mer uncountable on my hands. I have seen the atrocities of war and the hideous excess of peace. There is nothing left for me in this world." name is unimportant: "What is the use of knowing my name? If it will make you more comfortable, you may call me Umbra. It is the name of my blade, though it may as well be mine." atrocities of war: "I have seen the wholesale slaughter of men, women, entire races of people. Villages have burned before my eyes--my hand has held the torch, and my hand has thrown water on the flames. I have been ankle deep in blood, swinging Umbra in a wide arc, all for the glory of the battle, and here I still stand." nothing left: "I have no more to do in this life. 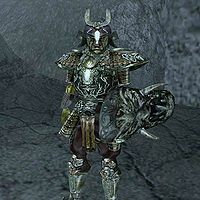 I have saved whole towns from packs of daedra, and I have slaughtered men for the glory of countless nobles. All that is left for me is my own death, and the gods have cheated me of that. All I ask is to die like a warrior, but how can that be?" "I don't believe it is too much to ask to die as a warrior should -- in battle. It is my curse, though, that I have found no one that can best me in combat. Are you the one that can? Can you come and lift me from these shackles of life? Come then, be the new wielder of Umbra!" I will give you the death you deserve. "Excellent! Perhaps now I will be granted a warrior's death. And if I am not, know that you will be." No, I'm sorry. "You disappoint me. Perhaps one day you will come relieve me of my burden. Until then, I will search for the one who will."